As I was growing up, teachers and other authority figures made me feel more comfortable about the state of the world by asserting that past atrocities like the Japanese Internment and the Holocaust couldn’t happen today. Adulthood pokes holes in the theory that we as a people won’t make the same mistakes and commit the same crimes we have throughout history. But it’s never been as starkly clarified how much the world can turn their backs to atrocities as with the current situation in Syria. Over half a million people have been killed this decade in the country, and millions have fled the nightmarish situation for countries throughout Europe and even all the way to the United States. And, for the most part, the world has done nothing. Evgeny Afineevsky’s “Cries From Syria,” opening in limited release today and playing on HBO on Monday night, isn’t so much a documentary as it as confrontation. Look at this and ask yourself if you can still do nothing. It should be required viewing for everyone in a position of power worldwide, especially those who would choose to enable genocide and stigmatize those who flee it. Inspired by the Arab Spring that toppled dictatorial regimes around the region, a group of young men spray-painted “It’s Your Turn, Doctor” on walls around the city of Daraa, Syria in March 2011. The “Doctor” was a reference to Bashar al-Assad’s background as a physician, and the seeds of a revolution felt like they were being planted. Sensing the dissatisfaction of his own people, Assad did what madmen in positions of power often do—he responded with brutal, unimaginable force. The boys responsible for the graffiti were arrested, tortured and killed. Their deaths became a catalyst for a greater revolution, which resulted in even more horrifying action from Assad and his people. As protestors marched with roses and bottles of water for the soldiers, people disappeared or were tortured, often returned to their families unrecognizable. Over the next few years, the Syrian Army would battle with the Free Army and other protestors, turning the West half of Syria into a war-torn battlefield. Portions of the country deemed revolutionary to the regime would be cut off from supplies, leading to deaths by starvation. They would be bombed, often indiscriminately, meaning schools would be destroyed in the middle of the day, when they were full of children. The battle became centralized in Aleppo, the biggest economy of the region, as bombs fell on Daraya and Daraa to such a degree that kids would burn tires near schools to create enough smoke to make them difficult to fly over. And then Assad and his army started using chemical weapons, dropping Sarin Gas and Chlorine on his own people. As the region became increasingly unstable, ISIS took advantage of the power vacuum, taking over rubble-strewn villages, kidnapping the boys left there into their cause and beating the women. And then Russia and Putin sided with Assad, aiding in the bombing of cities like Aleppo, which has essentially been reduced to rubble and bodies today. Of course, men and women fled, often dying as they tried to get to safety, or being turned away from countries unwilling to accept refugees. And most of the world did nothing. 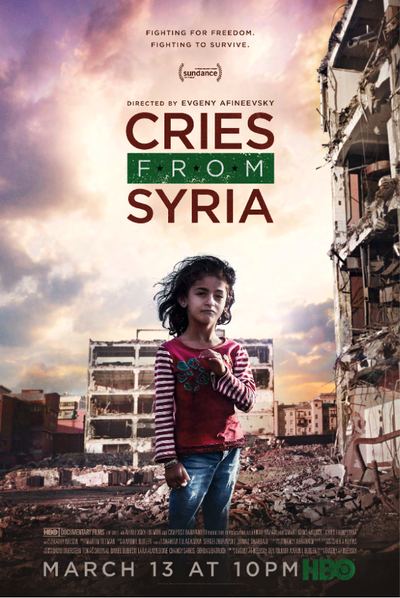 The political and global scope of the Syrian situation isn’t directly addressed in "Cries From Syria," which chooses an on-the-ground approach made up of footage caught by phone cameras and small digital cameras over the last six years. This was a revolution altered and documented by technology, and it allows us to serve witness to atrocities in ways we never have before. “Cries From Syria” contains some of the most startling, unforgettable footage I’ve ever seen in my life: A toddler drowned on the shore after an over-stuffed boat of refugees capsized; the bodies of children who starved to death from a lack of supplies; horrendous torture scenes, including a shackled man set on fire and a beheading; babies literally dying from Sarin Gas poisoning in front of the camera. You will have to turn away from “Cries From Syria.” It took me several sittings to get through it. And witnessing this kind of horror is the only way to fully comprehend what’s happening. And why action must be taken, and support must be given. The impact of “Cries From Syria” can be almost numbing. I did wish for a politician to explain why the world has turned away or a military expert to offer advice as to why powerful countries have allowed Assad to use chemical weapons on his own people. It’s horrible to say but the shocking atrocity of the last six years in Syria is apparent early in the film, and I wished for the filmmaking to expand to other subjects like what happens now and what can be done. The final half hour gets to a brief bit on The White Helmets, the people who run in after the bombings to help others, and I wanted more of that story as well, a balance to the human stories of horror and proof that people can be heroic even in a living Hell. “Cries From Syria” can be so committed to its on-the-ground approach that we lose the scope of the international story here. We feel trapped in Aleppo, unable to see how this ends without the complete destruction of a country. Although perhaps that’s the point. Those authority figures from my youth loved to use the phrase “Those who do not learn history are doomed to repeat it.” “Cries From Syria” reminds us how much we still have left to learn.